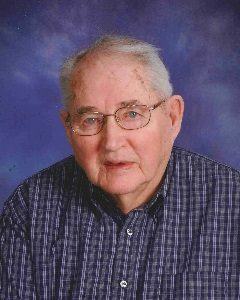 George Michael O’Donnell, age 87, of Glencoe, passed away on Friday, January 25, 2019, at Abbott Northwestern Hospital in Minneapolis, Minnesota. Mass of Christian Burial will be Friday, February 1, 2019, 10:30 A.M. at Church of St. Pius X in Glencoe with interment in the Glencoe Catholic Cemetery. Visitation will be Thursday, January 31, 2019, from 4:00 P.M.-8:00 P.M. at the Johnson-McBride Funeral Chapel in Glencoe. Visitation will continue from 9:00 A.M.-10:30 A.M. at the church on Friday. Prayer Service will be at 6:00 P.M. on Thursday. George Michael O‘Donnell was born on November 8, 1931 in Glencoe, Minnesota. He was the son of Michael and Elizabeth (Reinke) O’Donnell. George was baptized as an infant on November 15, 1931, by Father P.C. Maloney and later was confirmed in his faith on June 8, 1946, both at St. George Catholic Church in Glencoe, Minnesota. He received his education at Glencoe High School graduating with the Class of 1949. He entered active military service in the United States Army on May 22, 1956. He served in Germany for 18 months during the Cold War. George received an Honorable Discharge on May 7, 1958. On June 24, 1961, George was united in marriage to Jo’Cleta Junn in Minneapolis, Minnesota. George and Jo made their home in Glencoe. Their marriage was blessed with five children: Brian, Brennan, Lisa, Bradley and Denise. George and Jo shared over 57 years of marriage together. George worked at Johnson Motors as a Service Manager for 42 years. George was a faithful member at Church of St. Pius X in Glencoe, where he was a member of the Knights of Columbus Council and served as a board member at St. Pius School and Catholic Board of Education. He was also a member of the Brewers Baseball Association Board. George enjoyed reading newspapers and magazines, gardening, outdoor barbecuing, watching world news, old tv shows and loved sports especially football, basketball, and baseball. He also enjoyed working the concession stands for high school sports and Glencoe Brewers baseball games. George loved his sweets, especially double stuff Oreos and lemon drops. He cherished the time spent with his family. George passed away on Friday, January 25, 2019, at Abbott Northwestern Hospital in Minneapolis, Minnesota, at the age of 87 years, 2 months and 17 days. Nieces, nephews, other relatives and friends. George was preceded in death by his Parents, Michael and Elizabeth O’Donnell, Father-In-Law and Mother-In-Law, Joseph and Bessie Junn, Brothers and Sisters-In-Law, Donald and Viola O’Donnell, Raymond and Ruth O’Donnell, Brother-In-Law, Edward Junn; Granddaughter, Brea O’Donnell. Very sorry to hear of your loss- my best to Parker, you and family. He was a kind and gentle man! George was such a supporter of athletics at Glencoe and then at GSL for so many years. What a wonderful man! He will be greatly missed! Sincere sympathies to all. May God keep you all wrapped in His loving embrace and give you Peace. I worked with George for many years at Johnson Motors. He was a kind, quiet, and dedicated man. He loved his family dearly, he loved to tell stories about his children and grandchildren. You have my sincere sympathy. Let your memories comfort you through this difficult time. You are all in our thoughts and prayers. To live in the hearts of those we leave behind is to never die.